At Next Day Jumps LLC we are fanatics about horses and horse jumping. We think that our horse jumps are the best quality that money can buy. We sweat the details and we are immensely proud of our horse jumps. In every possible way we make the best jumps we can. The only problem with PVC horse jumps has been that PVC is more expensive than wood - making PVC horse jumps more expensive than wood horse jumps. Next Day Jumps LLC has overcome that hurdle. The price of our PVC horse jumps are comparable to inferior wood jumps. While the PVC material is still more expensive than wood, our computerized manufacturing process has reduced the labor of building PVC horse jumps to a point that it is a fraction of the cost of building wood horse jumps. PVC does not rot ever. The material we make our jumps out of is Duralon. Duralon has modifiers added to the PVC to make it more flexible and more resistant to cracking than regular PVC. Next Day Jumps LLC are the best, most well built jumps available yet our prices are the lowest. Better jumps at a lower price cannot be found. We regularly scan competitive prices on the internet and our horse jump prices are the lowest for a well made full size jump. Bill Me Later is a PayPal service that lets you buy now and pay later. Buy all the jumps you want now, and pay later. It is easy to use, just select the jumps you want then choose the Bill Me Later option in checkout. 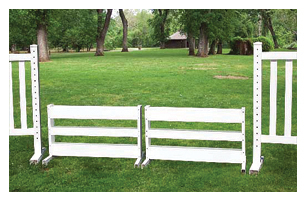 Next Day Jumps LLC has a complete line of horse jumps: standards, wing standards, schooling standards, walls, brush box, gates, jump cups, planks, walls, vertical walls, picket gates, flower boxes, fillers, lattice standards, and cavalletti. *must be comparable jumps, not closeouts, not one of a kind, not used, not defects, offered by normal retail outlets. Prices must be published and verifiable online or in print, not private offers, comparability to be determined by Next Day Jumps LLC.